The rules given below for the care and maintenance of lizards belong to the basic knowledge of every lizard-keeper. They are rules that retain their worth and importance as long as you care for lizards. Before you buy a lizard, inform yourself about its particular life requirements in the terrarium. You must also be knowledgeable about the requirements for living space, climate, and food of the chosen lizard species. You should never forget that lizards are wild animals that need no petting but do need the expert knowledge of the keeper. All maintenance measures must be carefully carried out. Hygiene affects not only the health of the lizards but also protects the keeper from possible damage to his or her own health. The terrarium, whether one or a group of several, must be arranged to be observable because this facilitates routine maintenance. Technical installations and arrangements must be so planned, installed, and maintained that neither animal nor human can come to harm. It is important to observe the lizards carefully and often enough to notice any changes in behavior or appearance as soon as possible. Otherwise you will be unable to come to assistance promptly, for example, at the beginning of an illness or refusal of food. Always be conscious of the responsibility that you have undertaken in keeping the animals. Note: If you want to keep the more frightening lizards — such as large iguanas – or want to raise food animals that might annoy the neighbors by noise or smell, you should obtain permission from your landlord. Since lizards cannot produce their own warmth, they are dependent upon the correct temperature in their environment. The lizard-keeper must therefore try to create the best possible appropriate climatic conditions for this type of lizard. Besides temperature, climate includes humidity, precipitation, light, and air pressure. Moreover, the rhythm in which these occur in the change of seasons and between day and night has a crucial effect on the lizard. This means that you must constantly control these factors and must adjust the circumstances of daytime and season. The change from day to nighttime climate is extremely important, because it profoundly affects the vitality of the lizards. An appropriate climate in the terrarium can only be created and maintained with the help of technical apparatus. The required humidity will be achieved in the planted rain-forest terrarium by watering or else by the daily spraying of the plants. In the unplanted terrarium the ground may be dampened with a spray bottle and, if necessary, gently heated so that the desired humidity will result from steady evaporation. The humidifiers sold in stores are only suitable for very large terrariums. Note: Without fail, monitor the required air circulation in the terrarium. Not only for aesthetic reasons but even more for hygienic ones, the urine and feces of the lizards must be removed from the terrarium as soon as possible. The floor medium must therefore be renewed as the occasion demands. 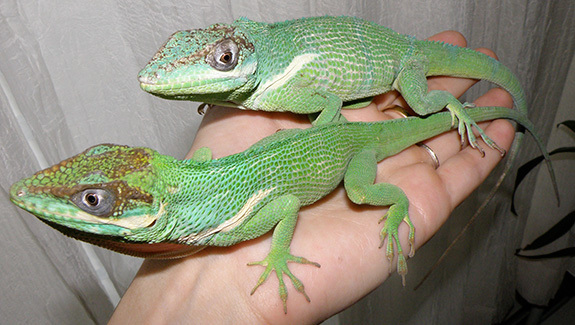 The interval necessary between cleanings or changes of floor medium depends on the size and number of the lizards being kept, so it isn't possible to give an exact rule. A lizard-keeper who observes the terrarium daily will quickly determine how often cleaning is necessary to keep any bad odor from occurring. A simple arrangement of decorations is recommended to make it possible to carry out the work of cleaning quickly and thoroughly. The proper equipment is also important: you need sponges, brushes, a scoop, and tweezers. You can also use the same tweezers, thoroughly cleaned, as feeding tweezers. The equipment should be cleaned as thoroughly as possible after each use — preferably under household bleach and running hot water. Disinfecting it between uses is highly recommended. You need separate cleaning utensils for each terrarium. The equipment should be disinfected after each use. Choose a volatile, i.e., a fast-evaporating disinfectant because a relatively long rinsing time will be required for others to avoid any residue. Decoration materials must be disinfected especially thoroughly if you take them out of one terrarium for use in another. Disinfection is even more essential after the death of a lizard! Remainders of food or of food animals that have not been eaten by the lizards should under no circumstances be used to feed animals in another terrarium. If you don't want to throw remainders out, then the second time around use them only in the same terrarium. Plants that have been removed from a terrarium should be cared for outside it for a time (several months) before being replanted inside. Most lizards accomplish their molting without any difficulty; occasionally the keeper must remove the remaining portions of the old skin. In very rare instances — most often resulting from insufficient humidity — some skin will remain at the ends of the toes. If such remainders dry out, they can constrict the toes so tightly that a portion of them can be lost. You must avoid this; soak the foot briefly in warm water or allow the lizard to run on damp bath toweling and then remove the skin. Long, sharp claws are typical for many species and ought not to be cut. But with ground-dwelling lizards they may become long and curved because the floor material is artificial or the animal isn't active enough, and then they must be clipped. Be careful not to cut into the part of the claw where there is blood circulation. As a beginner, you should probably have the claw-cutting done the first time by a veterinarian, an experienced pet-shop owner, or another lizard fancier. To be able to do claw-cutting, force-feeding, or treatment procedures in case of illness, it is usually necessary to take the lizard in your hand and hold it so that neither human nor lizard can come to harm. Small to medium-large lizards must be grasped quickly and with sure aim. Thumb and forefinger of the dominant hand hold the lizard behind the head and fix it so that it can't bite. The palm lies on the lizard's back, the three free fingers grasp the legs from underneath and fix them toward the backswept hips and tail. Thus the lizard cannot bite and scratch, and it is not in danger of shedding its tail or injuring it by wild thrashing. The necessary measures can then be administered with the other hand. Larger lizards can scarcely be held and treated by one person alone; a helper is necessary. The keeper holds the neck with the nondominant hand and thus fixes the head and the forward extremities; the dominant hand grasps the tail area and thereby holds the rear extremities at the same time. For a large and aggressive lizard, the tail must also be fixed by being grasped firmly between the keeper's legs. All the necessary ministrations to the lizard are carried out by the second person. Only someone who observes his lizards regularly and knows how they behave can judge promptly whether a lizard in a terrarium is undergoing a stress situation. If a lizard is constantly threatened by one of the others or if an animal shows the submissive behavior pattern too often — for example, treading — the keeper must intervene quickly. Otherwise the dominated lizard will languish and can even die in such circumstances. By building up the decorations, you can erect barriers that provide the dominated animal with its own territory. If this is not possible because the terrarium isn't big enough, the only thing that will help is separating the lizards. You should by all means avoid introducing a new animal into a terrarium in which the inhabitants have already established their own territories. The new animal will soon suffer submission stress. If the introduction of the new inhabitant cannot be avoided for some reason, it is recommended that the original animals be removed and only replaced after the new one has become acclimated. Usually old inhabitants can still dominate because it recognizes the familiar surroundings; in this case rearrangement of the terrarium is the only help. Mixing of several different species can also produce a stress situation. Basically you should provide each lizard type with its own living space. In sufficiently large terrariums — or in a greenhouse — some kinds can be mixed together. A prerequisite for this is that the lizards be about the same size and that no personal antipathies (there are such things with lizards, too) can be observed. Very close and regular observation is extraordinarily important in any mixing situation because a dominated lizard can quickly disappear into a difficult-to-see corner. Those lizards that can be mixed with others are listed in the last chapter. Anyone planning to mix several kinds of lizards should start out with an entirely new terrarium. The disruption of “household peace” by a dominant lizard strengthened by a sense of territorial possession will then be ruled out ahead of time. The care of a lizard terrarium during vacation time is relatively simple if you find a responsible person who can look at the terrarium occasionally. Naturally it would be best if another keeper of terrarium animals could take over. In any case, the vacation replacement must be well instructed, for even an experienced terrarium-keeper must get to know his charges beforehand and be able to focus on individual details. Above all he must make himself familiar with the technical equipment ahead of time so that he can deal quickly with any failures. Before your departure you should make arrangements that will somewhat ease the duties for your replacement. • Place the terrarium so that there are no possible outside influences on the temperature inside it — for instance, by sunlight falling on it, which might result in dangerous overheating. • To induce a phase of decreased activity in the lizards, the temperature in the terrarium can be reduced by 9°F (5°C) by, for example, not turning on the heating lamp or the spots. In this way any possible aggressive behavior will be checked and also the lizard's energy needs will be reduced considerably so that they need not be fed and the excrement will not collect as often as under conditions of optimum temperature. • Tell your substitute that the provision of drinking water and the watering of plants is important. Because of the lowered temperature and the resulting lower evaporation rate, these measures are only necessary at wide intervals, to be sure, but they must not be neglected. With a well-informed vacation replacement and the above rules, your lizards can last out a three-week vacation unharmed.